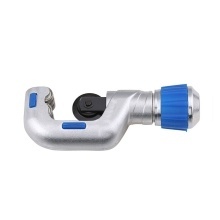 This product is made of fine quality aluminium alloy, practical to use and not easy to broken. High speed steel blade provides you the high accuracy cutting. The tops of cutter has ball bearing, flexible and smooth. Perfect for the cutting of copper tubes, aluminum tubes, stainless steel pipes, etc. Grinded cutter blade, made of fine quality aluminium alloy. Special tapered roller bearing type, make cut easy. Professional refrigeration & auto-repairing tools. For cutting copper iron&stainless steel tube. Non-slip handle, safe and convenient to use.